Chief Research Guru Michel Janssen shares a recap below of three takeaways from our recent webinar, “Is Your Shared Services Strategy Future Ready? 5 Differentiating Talent Capabilities“. We just completed our webinar on our shared services or GIC Talent Pinnacle Model. And what were trying to there is understand, what are those key business issues. So the first thing we looked at is how the talent shortage is becoming chronic. And one of the statistics I used here with clients – I talk about how it used to be that executives were just concerned about the top talent – “how do I get the best talent in the organization” – so they can have an impact on the rest of the organization. But now, as we become more chronic in the numbers – and what I mean by the number is ten years ago, in the US, it used to be 700 people looking for 100 jobs. And right now in the U.S., we have 90 people looking for those same 100 jobs. And so, what you’re finding is that there is more demand than there is supply in that conversation. But it’s a bit of a tale of two worlds. While you have shortages in the U.S. and Europe you’ve got a very different thing going on in low-cost locations, especially like India. And there, there’s not a shortage of talent, it’s finding the right talent – they’re concerned with, “how do I take the existing pool of people in and upskill them or reskill them into the needed skills for the organization to go forward. So, what we’ve done is look at the Pinnacle Model, and we have found that there is a very dramatic cause and effect. And what we’re looking at in the Pinnacle Model – the way it works is you’ve got capabilities on the X axis, and you’ve got outcomes on the Y axis. And what you’re looking for is a nice correlation that goes from lower left to upper right. And what we’re trying to do there is establish the things that make a difference. And so, what we did in the rest of the video was talk about those capabilities that made that difference. So we think those are impactful items, and if people were endeavoring to execute on those items, they got the results they were looking for. So click the link, and take a look. Supporting enterprises’ innovation agendas is no longer simply an opportunity for in-house shared services centers – what we call global in-house centers (GICs); it’s fast becoming a competitive imperative. And, contrary to popular perception, cracking the innovation code requires much more than just novel ideas. Success entails boarding the right people on the bus, gearing them up with the right mechanisms to drive agile decision making, and reengineering the organization’s cultural DNA to foster innovation. We’ve developed a simple approach that will help you solve this complex problem. Let’s take a look at the three components. The first element is formulation of the right mechanisms to evangelize innovation initiatives. It requires the right idea generation mechanisms to harness unique ideas from both internal (GIC and parent company stakeholders) and external (including startups, academia, and service providers / specialists) ecosystems. A critical part of this is evaluating the strategic rationale for the partnership. While some shared services centers partner with third-party providers and start-ups for talent augmentation and skill acquisition, others leverage the connections to develop domain expertise or increase the speed of innovation. Another essential component, specifically for GICs, is the right funding mechanism. While we see most shared services centers carving out a separate fund for innovation (which is part of the overall GIC CEO budget), we are increasingly seeing them push for a global/centralized fund where the innovation team within the center operates as an extension of the global innovation team(s), and is funded by centralized global venture funds / programs. For select initiatives, we have also seen GICs securing funding from business units and driving project-based innovation initiatives. The third component here is timely deployment of robust governance mechanisms. Shared services centers need to adopt a disciplined approach to rigorously track performance and incorporate remedial feedback on a continual basis. This not only helps to assess the effectiveness of activities, but also guides allocation process for resources, and helps assign accountability for actions/responsibilities. Involving the right people in the right team structure is the second critical component. Leading GICs involve stakeholders from different parts of the organization, i.e., functional and business teams, central innovation groups, R&D departments, and corporate teams to invest time in exploring adjacent and transformational opportunities. This helps in cross-pollination of teams and enables development of a holistic solution in an accelerated go-to-market timeframe. While we have seen varied designs for innovation teams (based on organizational fit and business alignment), the common thread is the focused top-driven approach to creating structural changes, supplemented by continuous support from middle management to ensure smooth implementation. Another key initiative leading centers are taking is remodeling their existing talent practices. They are now shifting their focus from hiring for specific “skills” to hiring for “learnability” / “thinking skills”, i.e., the ability to innovate. They are incentivizing innovation, and providing special recognition for outside- the-box thinking. We are also seeing strong innovators recalibrate their existing performance measurement metrics to align with the impact generated against the business objectives. The third principal tenet to ensuring foundational success on the innovation journey is dedicated investment in developing a customer-centric culture with active CXO-level participation. Shared services centers are deploying multiple tools to reengineer their DNA and develop a culture that breeds innovation. Most successful examples include: gamification of programs and distinctive recognition for positive reinforcement; stimulation of an experimentation mindset and instillation of risk appetite; and adoption of flexible employment models, including remote working, crowdsourcing, and open innovation. Although new technologies are path-breaking, we believe that the key to a GIC’s success is incremental innovation. They should keep testing small-scale POCs to demonstrate end-client value and build credibility. Successful implementation of pilots can help them instill confidence among parent stakeholders, and ensure adequate support and funding for much larger scale initiatives. This process also presents centers with an opportunity to course-correct early and drive/lead enterprise-wide digital initiatives. If you’d like detailed insights and real-life case studies on how GICs have effectively driven the innovation agenda for their enterprises, please read our recently published report – Leading Innovation and Creating Value: The 2019 Imperative for GICs. And feel free to reach out to us at [email protected] to explore this further. We will be happy to hear your story, questions, concerns, and successes! India continues to offer an attractive service delivery location proposition for global companies, given its unique combination of a low-cost, scalable English-speaking talent pool, and the breadth and depth of available skills. As the global digital services industry matures, and with increasing competition in the tier-1 cities, companies are looking to reduce the costs of talent and access additional untapped talent pools for digital services delivery. Can tier-2/3 cities in India fit the bill? Let’s start by looking at the current state of digital services delivery in these cities. 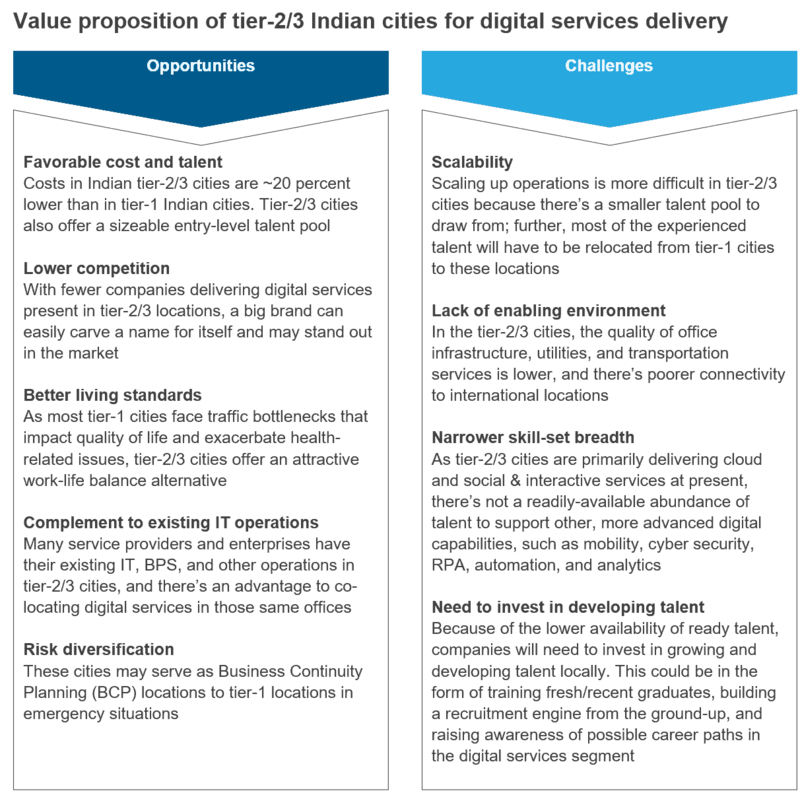 Today, India is the largest destination for digital services delivery, with 75 percent of the market. Tier-2/3 cities in the country currently hold 14-16 percent of the market share, and we expect this proportion to grow by 15-20 percent in the next couple of years. Ahmedabad, Chandigarh, Coimbatore, Indore, Jaipur, Kochi, Lucknow, T-puram, and Vadodara are the top nine tier-2/3 locations, accounting for 55-60 percent of the digital services headcount in tier-2/3 cities. 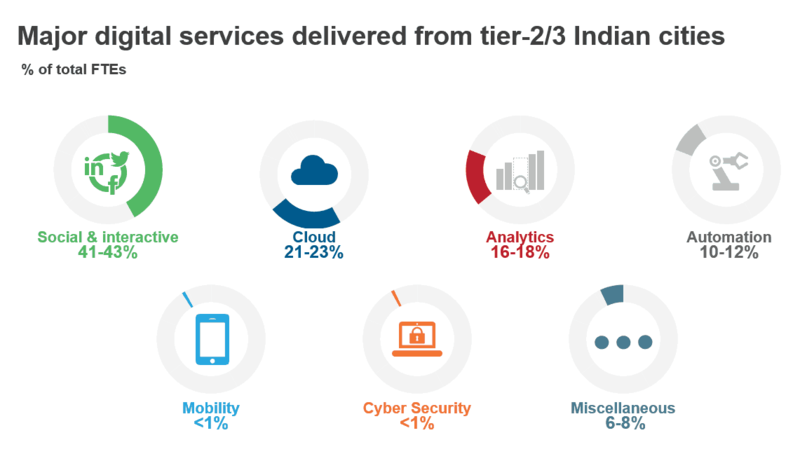 Tier-2/3 cities are mostly leveraged to provide social & interactive (41-43 percent), cloud (21-23 percent), analytics (16-18 percent), and automation (10-12 percent) related services. When it comes to sophisticated digital technology services, such as cybersecurity, mobility, and Artificial Intelligence (AI), service providers still prefer tier-1 locations such as Bengaluru. Now, let’s evaluate how tier-2/3 Indian cities’ value proposition stacks up against tier-1 cities. What’s ahead for India’s Tier-2/3 Cities? To learn more – including the metrics around availability of talent, market maturity, cost of operations, business and operating risk environment, and implications for market participants including buyers, service providers, investment promotion councils, and industry bodies – please read our recently published report, “Will Tier-2/3 Indian Cities Carve a Niche in the Digital Story?.” We developed the report based on deep-dive discussions with leading shared services centers, service providers, recruitment agencies, and other market participants. Clients considering establishing a shared services center – or what we refer to as a Global In-house Center (GIC) – to deliver services, almost invariably ask us how successful the model is and whether it delivers on the expected business impacts. To set the stage for answering the first question – how successful is the model? – the following chart shows that the number of new annual GIC set-ups has increased from <100 centers in 2015 to 145 centers in 2017, indicating a preference by companies to join the DIY bandwagon. Multiple factors contribute to this DIY trend, including: the need/desire to take a digital-first approach to service delivery; capacity/growth constraints in onshore locations; challenges with service provider performance; increased adoption of agile/DevOps; pressure to replicate the success of early adopters; and focus on end-to-end ownership in internal delivery. But that chart only tells part of the pervasiveness story. While it would be reasonable to state that the primary adopters of the GIC model are large enterprises, almost half of the new centers set up since 2014 have been established by small (USD <1.5 billion revenue) and mid-sized (USD <10 billion revenue) enterprises. This adoption – seen across technology, telecom, manufacturing, healthcare, and BFSI verticals – reflects that small and small and medium enterprises recognize the successes the large organizations in their sectors have achieved with the model. By all accounts and measures, it’s clear that use of GICs is becoming truly broad-based. Here are a few examples of the business impact real-world GICs are delivering beyond arbitrage. Reduce Errors – a leading financial institution’s GIC has improved the commercial lending analytical models, resulting in identification of additional US$15 million worth of deals that would otherwise have been ignored. Of course, the only way to ensure business impact beyond arbitrage is by intentionally establishing the GIC to deliver business impact. For example, we’re currently supporting a global investment management firm through the “impact-first” approach to its GIC set-up. Instead of starting operations with low-value transactional processing, the GIC will predominantly deliver high-end technology services to build tools and systems for quantitative research. The talent model is skill-centric, not scale-centric, and geared to build high-end skills in a sustainable manner. And because a key enabler of delivering business impact is ownership, the GIC will have end-to-end delivery ownership and a seat at the parent’s table to shape its evolution journey from the beginning. All these intentional actions will give the GIC a head-start in delivering business impact, and enable it to leapfrog its more tenured peers. Overall, having an intentional approach during set-up can significantly influence and enhance the type of business impact the GIC delivers, and how soon it kicks in. And a well-thought-out approach is more likely to keep the expectations from the GIC in check, and its performance assessment objective. Have you taken an intentional business impact approach with your GIC? Please share your experiences with us at [email protected] or [email protected]. To learn more about how we serve GICs, click here. There are two primary commercial options – or export-oriented schemes – available to GICs looking to export IT/ITES services from India. One is setting up a 100 percent Export Oriented Unit (EOU) under the Software Technology Parks of India (STPI) scheme. This allows operations to be carried out from any location in the country. The other is setting up a delivery center in a specified, demarcated, duty-free enclave called a Special Economic Zone (SEZ). These offer additional economic benefits (e.g., tax holiday) in lieu of positive net foreign exchange earnings from the export of IT/BP services. Which option is best for your company? Read on to learn the differences, the trade-offs, and the variables you should factor into your decision. Location: STPI units can set up operations in any location in the country. SEZ units are restricted to a designated area. Ease of compliance: Compliance and statutory reporting requirements in STPIs are relatively more lenient than in SEZs. For instance, introduction of GST has increased the compliance and record maintenance burden on SEZ units. Exiting SEZs may involve more scrutiny given the higher economic benefits involved. Everest Group recently supported a U.S.-headquartered financial services company looking to set up a small-scaled GIC in India to deliver high-end niche IT services. Our setup advisory team used a three-step process to ultimately recommend the right facility and commercial model to meet all the client’s requirements: outlining the space, handover timeline, and proximity to the central and/or secondary business districts; assessing potential savings in operating from an SEZ; and evaluating and scoring the additional pros and cons of shortlisted sites to make our final recommendation. When we evaluated and scored the client’s “must-haves” — scope for expansion or relocation, access to social infrastructure, lower commute time, and proximity to talent hubs – against the limited SEZ options available, it became clear that an SEZ was not the right answer for the client. Thus, we recommended that the client go ahead with an STPI option in a large IT business park, and register the unit with the STPI to benefit from indirect tax benefits. This option allows the client to take advantage of all the business park’s large talent pool, marquee tenant profile, social infrastructure, and other amenities, and gives it flexibility for any future expansion or potential relocation within or outside the business park. More than 30 new GICs are set up in India annually, and half of these are first-time center setups. In order to ensure their success, the enterprises establishing these centers must take the time upfront to clearly understand their objectives and requirements against the trade-offs of SEZs and STPIs.